One of the toughest assignments in digital photography is to shoot in harsh light, especially portraits. There are things you can do at capture stage, such as shoot Raw, use fill flash, try reflectors, and zoom in tight when possible. We also have better tools in post production, such as Highlight and Shadow recovery. 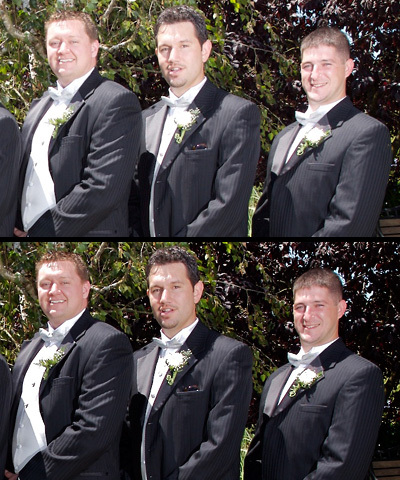 In this sample comparison here, I used the Highlight Recovery slider in Aperture to bring some skin tone back to these groomsmen. In this podcast, I talk about surviving harsh lighting conditions and recommend techniques for coming away with professional looking images. I noticed that you are still using film sometimes, and i had to ask you a few things. first, what films do you use other that the Fuji. one that you mentioned in the podcast? second, what film cameras do you have/ use? and last, how many cameras do you have? Yes, all together.... that means the digitals ones, the film ones, and even the old antique ones that you might have on a shelf somewhere. If it once could have worked as a functioning camera, then it counts. I think that this would be a cool project for lots of people in the Virtual Camera Club. I have 15 cameras total. I pretty much use Fuji print film these days for my analog cameras. I still have a good supply in the freezer that is lasting, in part, because I'm shooting less and less. Every now and then I will shoot some B&W, Ilford mostly. As for number of cameras I have, that sounds like a good topic for our forum over on Flickr. I'll post it there once I have a tally.